When it comes to work, I usually get more excited about projects that involve the creation of new methods of work or engineered devices, but sometimes it’s the projects that break things apart that can be thrilling too. 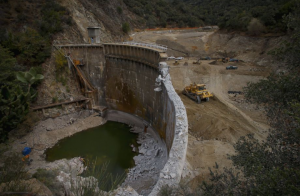 About 6 months ago I gave you an update on the incredible progress being made at the San Clemente Dam removal on the Carmel River, and as the project has reached a milestone phase I wanted to check in on the de-construction of the San Clemente Dam. This week, the dam removal project, the largest in California’s state history, started the process of removing 7,000 square feet of concrete and reinforced steel from the obsolete 106-foot high dam, originally built in 1921 on the Carmel River. The project will also feature completion of the new Carmel River route, allowing the river to flow again. For close to 100 years, the dam has served as a blockage to migrating fish, and the re-routing will create 25 miles of habitat for the threatened South-Central California Coast Steelhead for the first time since 1921. This project is a win on multiple levels; for the public, the environment, and the government. First, it removes a safety hazard to local residents and businesses in terms of earthquakes that could affect the structure as it existed. Next, it invigorates the habitat for fish migration and the use of the surrounding land. And it also will create 928 acres of public land, as California American Water is donating the watershed around the dam to be overseen by the Bureau of Land Management in perpetuity. As noted in this San Francisco Chronicle article, the project “could be a model for state water policy. And it’s certainly going to make a lot of steelhead trout happy.” The public-private collaboration among groups is to thank for this. There’s been a remarkable level of coordination and cooperation from various levels of government, the private sector and non-governmental organizations, such as the California State Coastal Conservancy, NOAA Fisheries, The Nature Conservancy, United States Fish and Wildlife Service and the Bureau of Land Management Carmel River Steelhead Association, and more. Building new things can be very rewarding, but you only get one shot at tearing something down in the right way. And while the San Clemente Dam is the largest in California ever to be torn down, it is not so unique. Many other older dams in California have filled with sediment, and there are about 200 potential similar projects with obsolete dams along the west coast. No matter what the type of infrastructure project we’re talking about though, the beauty is in the details and the process. The San Clemente Dam project has been wonderful to watch in this regard, and ultimately when the last construction vehicles are gone and the Steelhead trout are swimming up their “new” river in the fall, we can feel confident that a good job has been done. To view the progress of the Dam’s removal, visit sanclementedamremoval.org.